What is a Tubular Key aka Barrel Key? And what is it used for? A tubular key is what it sounds like...a circular key that is hollow like a tube. It is a type of key that is more secure because it is harder to pick due to its cylindrical shape. Unlike traditional keys, the cuts are not very deep and all along the bottom edge. These are not very commonly used keys but have been around for decades. Currently, they can only be made a select locksmiths with a specialy tubular key machine. 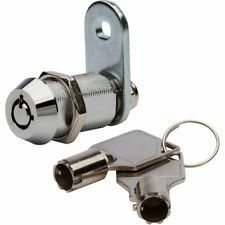 These types of keys are commonly used for vending machines although they are becoming more popular with bicycle locks and motorcycle locks especially for Harley Davidsons. Visit the Keyless Shop and get these hard to find key blanks made, please call ahead as not all our locations carry this key machine. We cut tubular keys for only $14.72! Come visit us today! Harley Davidson tubular barrel keys made here!